Tim Mueller, a Johns Hopkins University assistant professor of materials science and engineering, has been selected by the National Science Foundation to receive its prestigious CAREER Award, which recognizes the highest level of excellence and promise in early-stage scholars. His faculty appointment is within the university’s Whiting School of Engineering. The five-year grant of $400,000 will support Mueller’s efforts to develop and apply computational methods to predict the surface structures of crystalline materials. The method developed in this research will be used to facilitate the design of new materials for a wide range of technologies, including batteries, catalysts and sensors. In addition, this project will be integrated with an educational outreach program at the elementary, middle and high school levels in order to strengthen the pipeline of researchers who have the ability to use computers to discover and design new materials. Mueller will participate in the STEM Achievement in Baltimore Elementary Schools (SABES) program to assist with the professorial development of Baltimore City elementary school teachers, while Baltimore City middle school students participating in a robotics competition will learn computer programming skills from Mueller. A Baltimore City high school student will participate in the research project as a member of the research team. “I think it’s important to work with students at all levels of education to prepare the next generation of scientists and engineers to take on future challenges,” Mueller said. Mueller earned his Ph.D. in materials science and engineering from MIT in 2007. 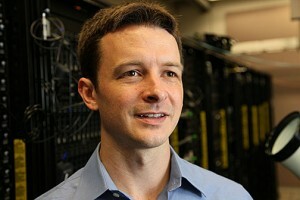 He cofounded Pellion Technologies, a company that is leveraging computational tools to develop advanced batteries. In 2012, he joined the Whiting School’s Department of Materials Science and Engineering. Color photo of Prof. Mueller available; contact Phil Sneiderman.